Shaking It Up. In reality and digitally. My dirty little secret? I'm NOT a procrastinator, unless you count sheer overwhelm... but I am... just a touch... OCD. So when I am assaulted by craziness, or I have to meet with a particular man, HWMNBN, (He-who-must-not-be-named), my coping mechanism is to tear something apart and put it back together. And I'm not talking about something small, like a piece of paper or an engine. I tear apart entire rooms. A month ago, after a particularly bad day, I tore apart my entire store and BeeHive studio. there were piles everywhere and the project became like one of those puzzles where you have to slide the little squares around in the right order to form the picture. I had to empty everything in order to move the furniture, but there was no where to move it since there were piles everywhere! It took me a few days to get everything into place. There are still piles of stuff to be sorted out, but I like the way the room feels. I can climb the ladder to the treehouse again too. Unfortunately - I was also able to see the huge mess that is up there! It looks like the Playmobil castle has been under siege by all the decapitated Lego mini-figures! A side effect of tearing it up - is that I find all kinds of things I thought I had lost. And that includes parts of projects. 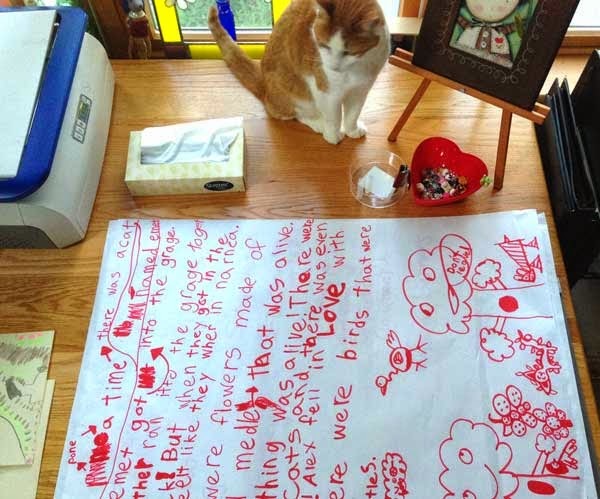 I have piles of sketches and ideas for books, piles of artwork, piles of Lilah's artwork. And I couldn't believe all the things I need to sort through in the flat file. That's a job for another day, another tantrum. It's actually very stressful. But I cleaned up my swing and my walk-in library - both comfy, relaxing places to hang out. No, I never have time to sit in either one. And before I had completely gained control of the studio, I was confronted with another unnerving encounter with HWMNBN and went looking for something else to destroy. So I started from scratch and completely redid my website! I switched from HostBaby to Weebly and I will probably upgrade to a paid site so I can integrate my shop and add video and other fun stuff. 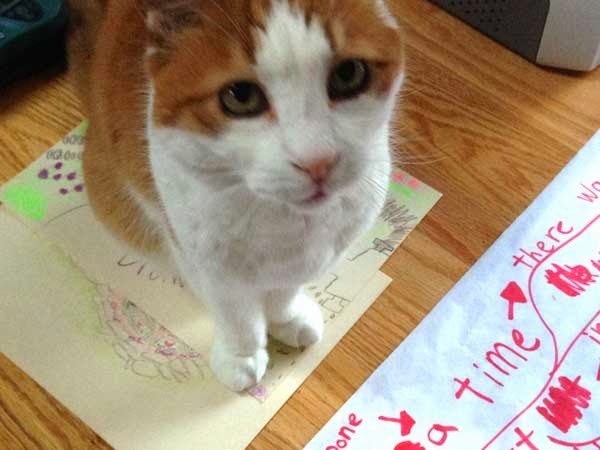 Lilah helped me redesign the site banner. 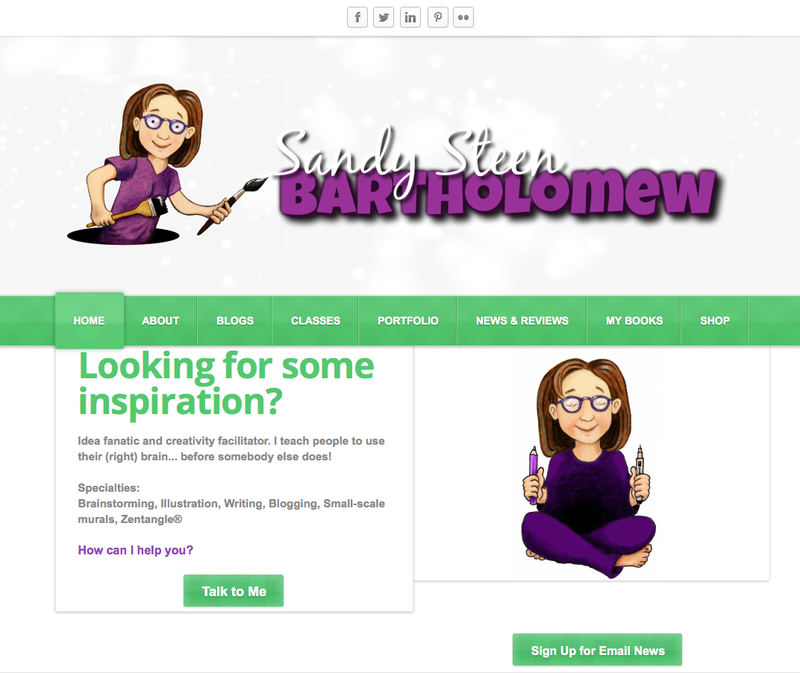 I wanted it to tie together with the new header on my Beez In the Belfy blog and she suggested I use my cartoon character here too. And lots of purple! Since a website is supposed to serve a function, I keep agonizing over what exactly it IS that I DO! And worse, how do I explain it to other people so that it makes sense? I've taken the biz classes and read the books and I will probably NEVER have an elevator speech. I hate elevator speeches. But I remember reading an excellent blog post by Seth Godin about Girl Scout cookies. Most people don't want to hear a spiel about the organization or a guilt trip about helping others. All they really want to know is "do you have Thin Mints?" Do you have what they want? What's in it for them? So if you would take a look around the site and let me know WHAT is it that you are looking for? I'm still working on it and would appreciate the input. What is it that I can offer you that no one else can? I'm on Linked In too. I just signed up for Bette Abdu's 4th Annual CZT Retreat in Waterville Valley, NH. It will be this October from the 23rd to the 26th. Bette does wonderful, relaxing tangle retreats! They are always in lovely locations with delicious food and lots of time for tangling and talking. Since there are no scheduled workshops or lectures, there is a lot more opportunity for spontaneous creation and experimentation. And this one has a twist! You don't have to be a CZT to attend (see the details on the website). Bette keeps the group small so we all get to know each other and have the chance to show our own work and techniques. If you'd like to hang out with us at the Valley Inn in October, reserve your spot and sign up soon! I am so excited to tell you about two events that I will be teaching at NEXT summer - that's July 2015. They will both be in Saskatchewan (that's in Canada!). I've never been there so that will be an adventure for me too. · Three breakfasts, three lunches, morning and afternoon breaks and two dinners. · All materials used in the classes and additional give-aways from a number of our favourite companies and a special CanTangle canvas bag to carry it all! · Journey with Laura Harms to explore the elegance of limits and the Challenges that arise from them. · Put on your walking shoes… (imaginary) and get your pen ready to holiday in Margaret Bremner’s beautifully inspired neighbourhood. · Sightsee in Sandra Steen Bartholomew’s lovely imagination and discover moonlight and darkness in a truly zenspired way! · Travel between the lines with Lisa Heron and design the pages of your own adventure. 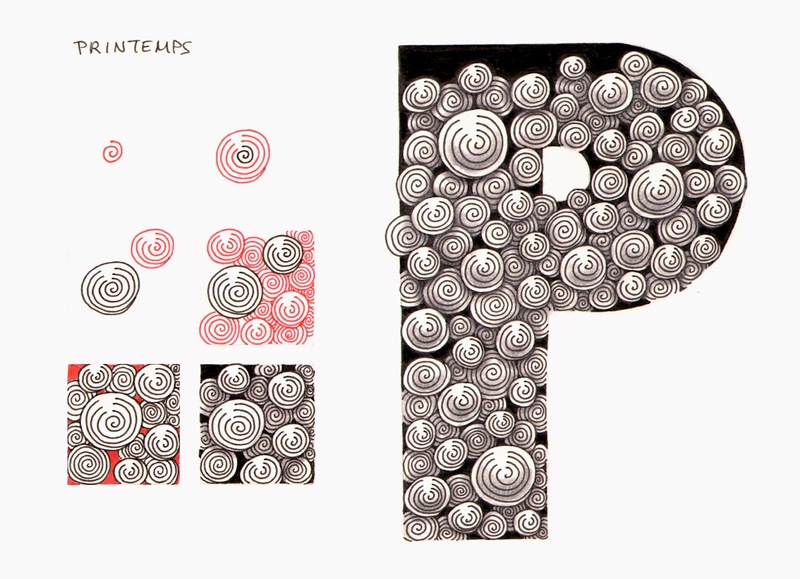 · Realize the power of utilizing Zentangle as a part of a meditative practice. 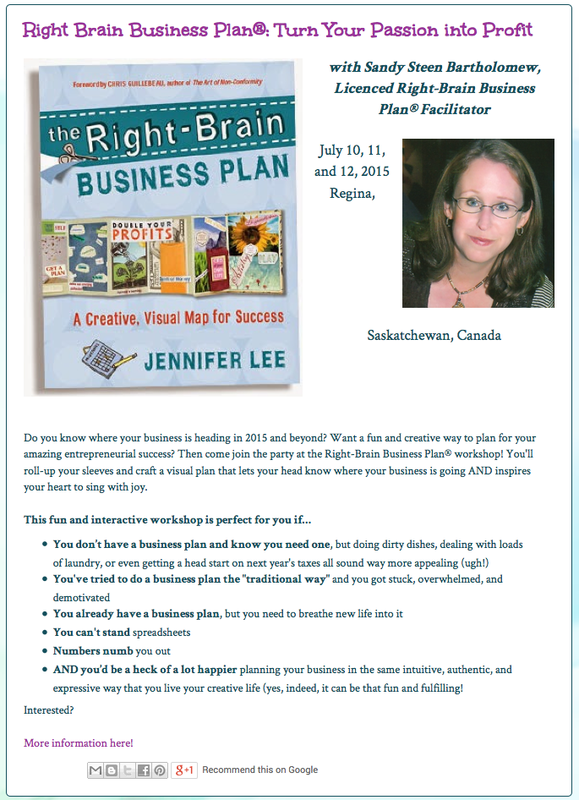 Next summer, I will also be teaching a Right Brain Business Plan Workshop, July 10-12, 2015. Thank you for your wonderful tangles, books, art and ideas. I first found out about Zentangle from your article in Cloth, Paper Scissors and I was immediately hooked. 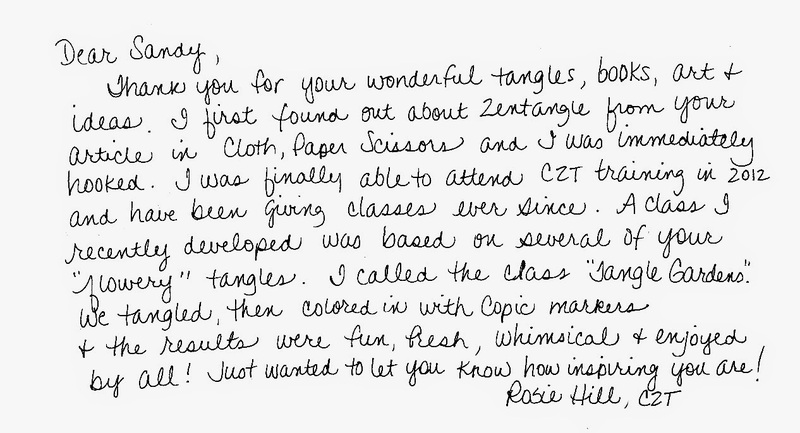 I was finally able to attend CZT training in 2012 and have been giving classes ever since. 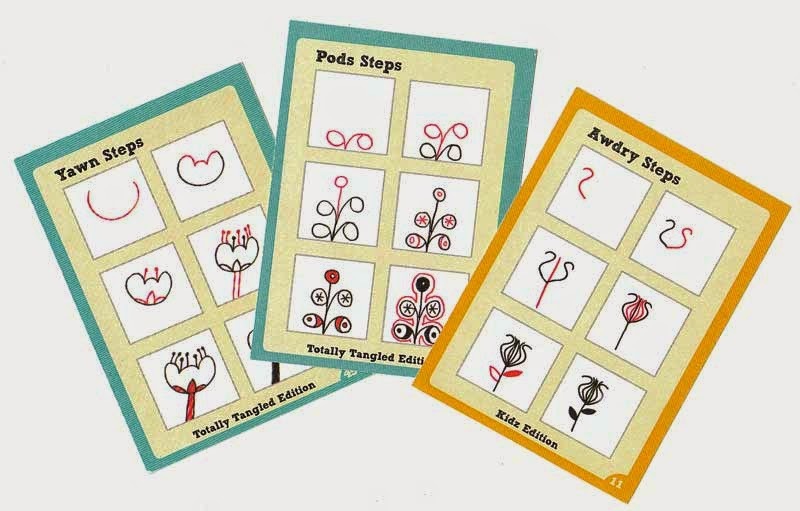 A class I recently developed was based on several of your "flowery" tangles. I called the class "Tangle Gardens." We tangled, then colored in with Copic markers and the results were fun, fresh, whimsical and enjoyed by all! Just wanted to let you know how inspiring you are! Anyway - I apologize for taking so long to tell you that I love the card you sent me and the sweet note too. :-) It's just gorgeous and I admit it is quite a thrill to get "real" mail again! A long time ago, I had a rubber stamp company and I used to get cool mail all the time - before the internet. I don't think I realized what a privilege it was. But speaking of the internet - I was hoping you would let me put your card and your note on my blog? I would be happy to put a link to your own website, classes, email - whatever you like. Yeah, me too....I taught kindergarten for 18 years and played the soundtrack & video countless times. I'm so glad you like my card and really tickled that you want to put it on your blog. You most definitely have my permission. I have just recently started reading your blog and I really enjoy it. In fact you inspired me to take the online class, Inkense, Soup to Nuts, which I am really enjoying. Thanks for ALL your inspiration. I don't have a website, but if you want you can direct readers to my shop's Facebook page: Facebook.com/rosiesartcarnival. I own a small papercrafting store in a small town on the Oregon coast. I have a lot of card making classes so I am a big advocate for snail mail. These three have no relation to each other... Yawn is based on a Japanese design, Pods is modern art, and Awdry was inspired by Little Shop of Horror! Yet, because of the line quality, scale and color - it works. And I love the polka dot ribbon. Be sure to visit her Facebook page - there are other great ideas there. I was actually ON my runaway-and-recover-and-recharge trip to Maine at this time, so it wasn't too hard to create a "Refresh" page. 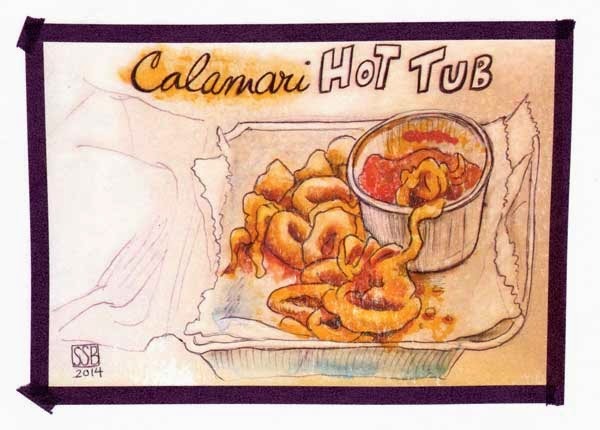 Unfortunately, the hot, crispy little calamari cooled off quite a bit while I did the drawing. But it was worth it. The hot tub idea just cracked me up. I used ballpoint pen to draw the sketch in my Moleskine journal and watercolors for the yellows and reds. I transferred the whole image to my Journal52 journal using Sheer Heaven and then stuck washi tape around the edges. I wrote about this one, when I finished it, on Mother's Day. This post has the words to the song too. 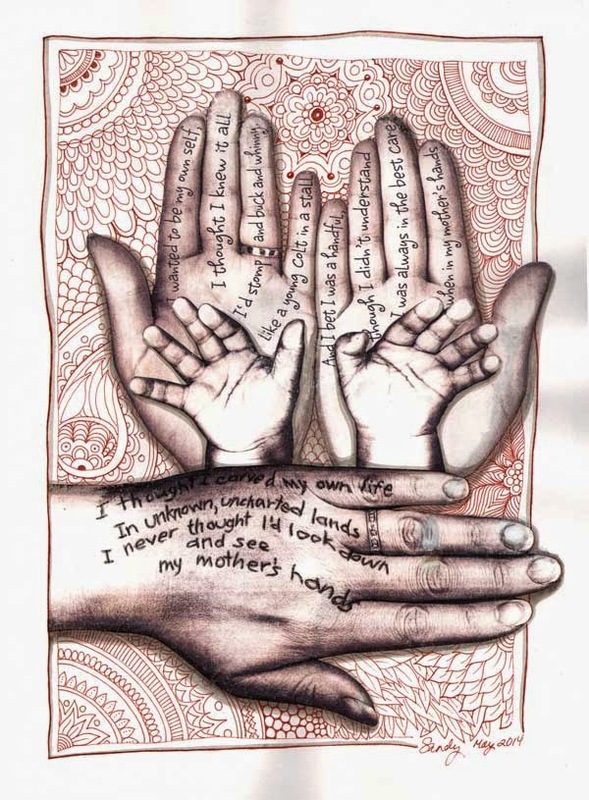 Photocopies of Lilah's and my hands with Brown Micron pen Zentangles. Lilah, my mom and I went to BrickFest in Manchester, NH - it was AHHH-MAY-ZING! 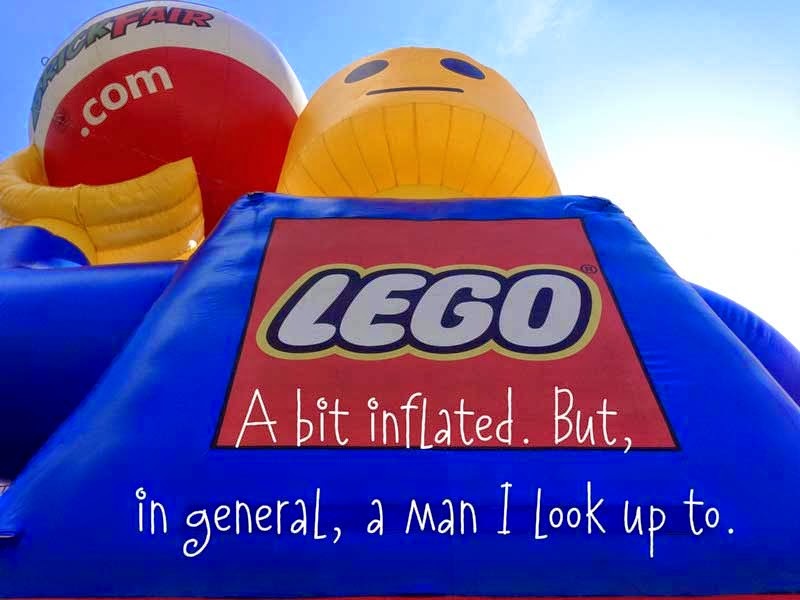 And this enormous balloon mini-figure...ummm..."maxi-figure"?.... was outside the convention center. I Photoshopped out all the anchor lines and added the text. Lilah and I are reading through the Harry Potter series. Probably my fifth or sixth read. I've lost count. I photocopied the pages from the first book where Harry frees the snake at the zoo. 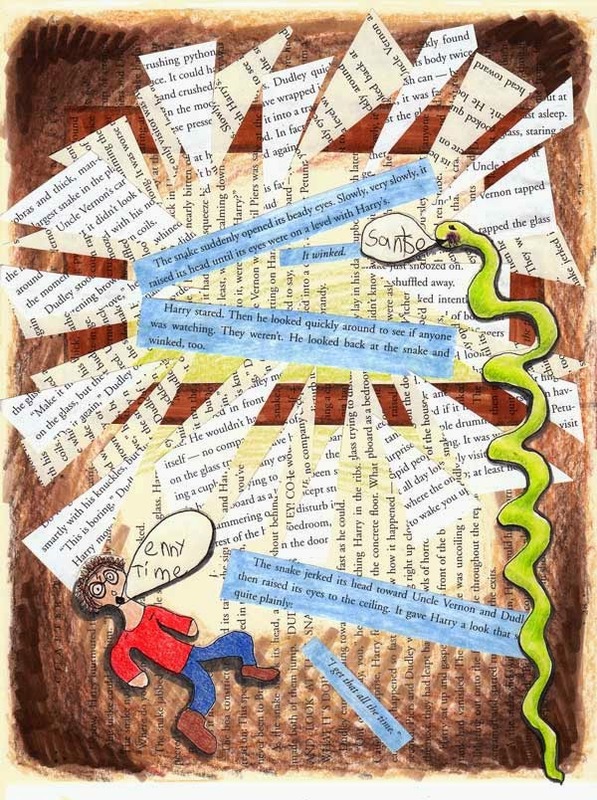 I cut apart the text so it looks like the glass of the cage shattering and Lilah drew harry and the snake. The snake is saying "Thanks" with a snake-y lisp ("Santse"). Harry is saying "any time" with a British accent ("Enny time"). It's colored with colored pencils and markers. For this one, I avoided making a Zentangle mandala...just because I wanted to really push myself. I used a technique that Marie Browning showed us at TangleU. 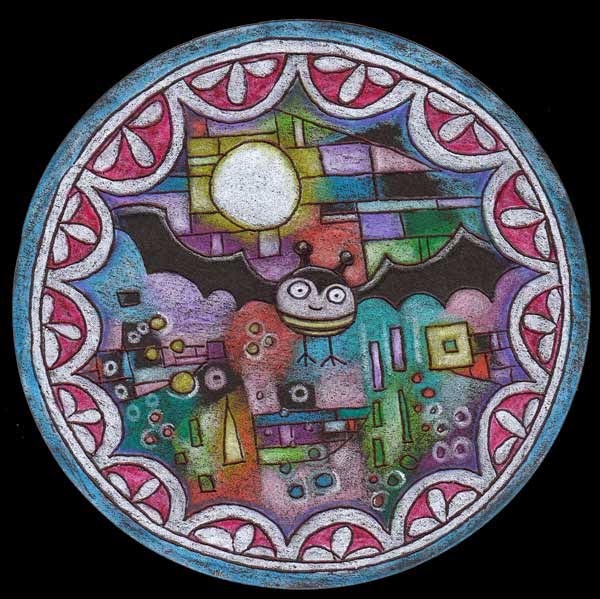 I drew the patterns and my Bumblebat with a black ballpoint (my favorite tool), pushing hard into the paper. Then I used colored pencils to color over the impressed lines. I didn't realize until I had finished that I had divided the background between rigid grids and freeform geometry. Interesting that it's not perfectly balanced. to the Tangle Library App! 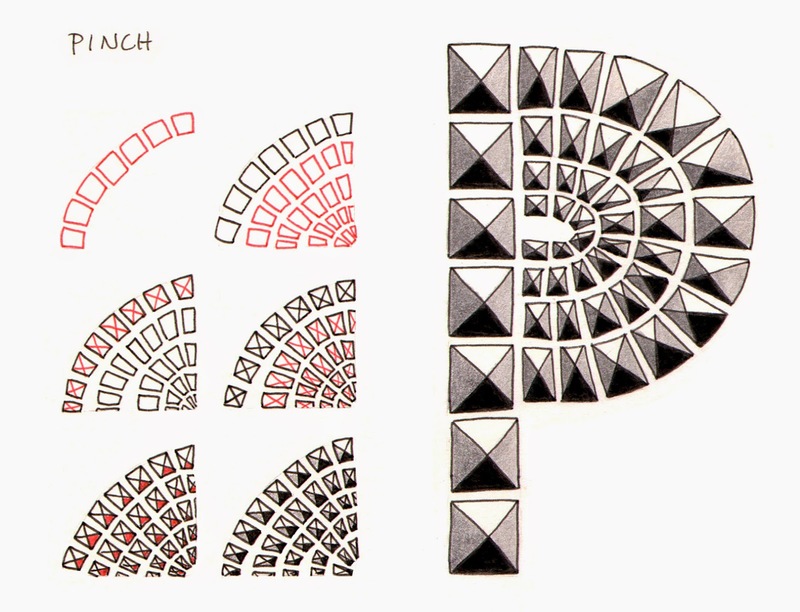 As you know -since every single one of you owns my very first Zentangle® book (and THE very first Zentangle book) - AlphaTangle was designed to serve as inspiration only. There are no step-outs for tangles included. In the beginning, folks used it to record the step outs as they learned them in classes. 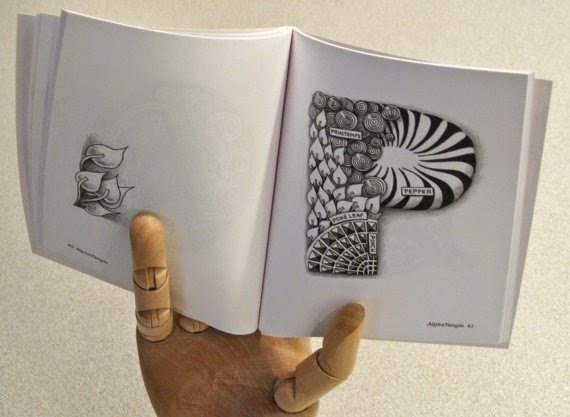 Others tore out the pages and turned them into alphabet posters for their classrooms (now I have posters available, no ripping necessary). And if you are lucky enough to have one of the original, self-published, adorably teeny, black-cover AlphaTangle books - you possess a cult classic! I had such a blast creating these and I hope you enjoy them too! If you don't own the App yet, you can download it through the iTunes store or on your iPhone or iPad in the App Store. Just do a search for "Tangle Library". If you already own Tangle Library and want the new IAP - be sure that you have Updated the App first, then open the App and click the little tag icon at the bottom of the screen. You will see the three choices for IAPs. If you have downloaded any, they will be marked "owned". You do not need to purchase a copy for each of your devices! If you purchase the IAP on your iPhone, next open the App on your iPad (or iPod), and click on "Restore Previous Purchases" (see above screen shot) and the new tangles will appear - like magic. If you are enjoying the App, please do leave a positive review in the App store. Every time a new update is released, the previous reviews get pushed away. The easiest way to reach Ian, or to ask him questions about the App or make suggestions... is on the Tangle Library Facebook page. When I wrote about Death in my last post, I had no idea that I was actually being prepped for an ordeal ahead. We'd only had the honor of Emmet LeChat's company for a little over a year, but he was very firmly ensconced in our family and our hearts. He had been deserted by his previous family - left behind when they moved - and was so skinny and malnourished, we thought he was still a very young cat. Now after multiple vet visits, x-rays, blood tests... we learned that he had the beginnings of kidney disease, an enlarged heart and heart disease, and various other strange problems at either end of his body. We suddenly discovered that he was actually quite an old cat - overnight. Taking him to cat specialists seemed unfair, expensive and... mean. That night, I tried to take the advice I had been given the previous Sunday, and I talked to my daughter about death and what would happen to Emmett. I told her we needed to remember that he was still with us for the weekend and we would love him and hug him and make sure he had lots and lots of love to take with him to heaven. That it was OK for him to go and we would miss him, but he didn't have to worry about us. Lilah was very sad, but she thought about what I had said and how Emmett had had the most wonderful life with us and we were lucky to have loved him. 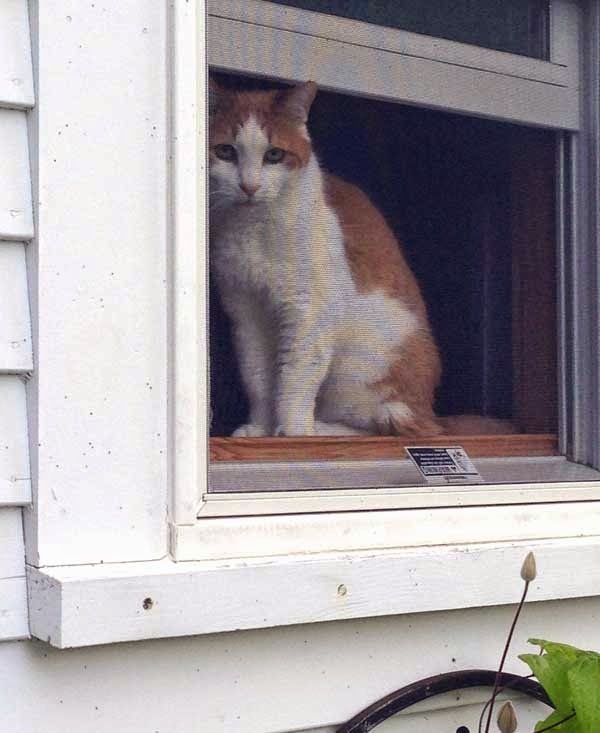 He was the most friendly, snuffy cat we had every known (and we have had many cats!) He loved everyone who entered the house. He put up with Lilah's cat-maintenance learning curve. Ah - mommy-panic!? Think, think... what does Emmett need? Attention. What does Lilah need? Attention. 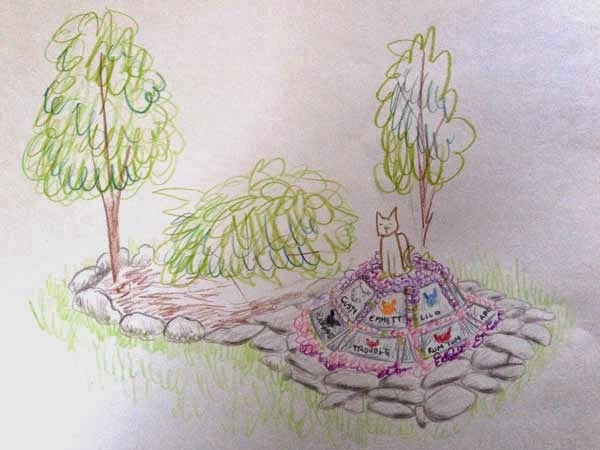 And an outlet for sadness... We sat on the deck outside my studio - in the beautiful sunshine, and drew designs for a new cat garden we are going to make. From our position, we could see most of the backyard and the current burial site (14 cats!?) was really pitiful. 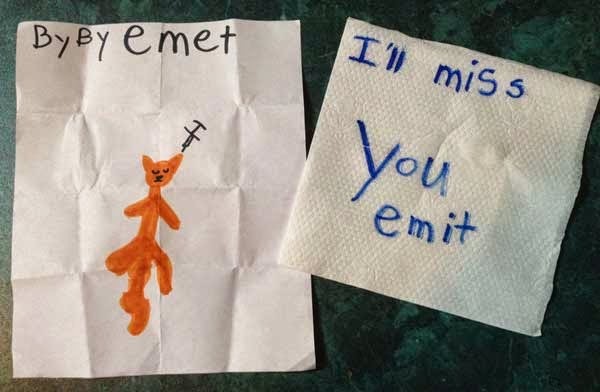 We both agreed that Emmett and his friends deserved a much better, happier memorial. I like the idea of creating a mound for my Bastet statue to sit on with cement stepping stones for each cat surrounding her. There's a huge forsythia bush already there that would be really cool to crawl underneath... and of course we need lots of stones around it all. Lilah agreed on the stones. She drew her plan of the whole backyard, from an aerial view. I can see that she is still thinking about the amazing garden I had outside my apartment in Maine - she has dirt paths and stone paths and very nice flower choices. Where I just put lots of phlox, she added pink and purple peonies and blue roses. 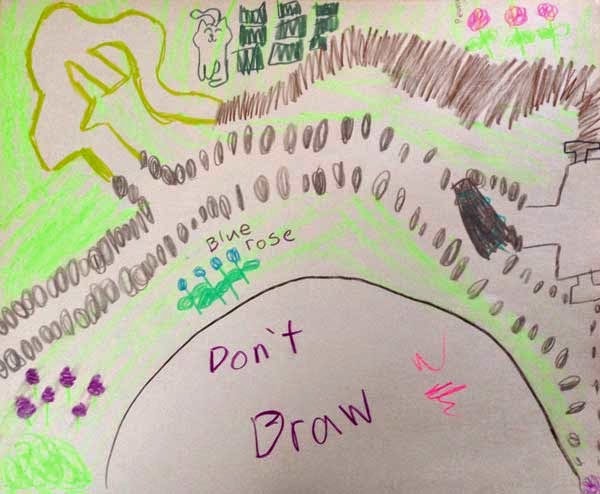 The "Don't Draw" part is supposed to represent our house. I see that she put a cat statue too, with green tombstones next to it. She said that her cat statue is MUCH bigger than my Bastet statue. Hmmm... I need to learn to sculpt in concrete! And then he sat on the landscape sketches - an interesting form of "stamp of approval"? I was actually glad my kids weren't here today. Taking Emmett to the vet and trying to keep my own brave face was too much for me. Even after making the "decision" I kept agonizing over it. And when they gave him the first shot, to make him sleep, he curled up on my lap and nuzzled his nose under my arm in total trust. I'll spare you the thought process and the logical arguments, but saying goodbye to a fur-child is hell no matter how you reason it out. And I didn't realize what an awful impact it was having on me until this afternoon. I was hit with a wave of nausea (etc) and a real fever. I've had bad autonomic reactions before, but they are usually brought on by physical pain - like surgery. I hadn't realized that severe stress could do it too. I felt like I had been given that sleepy shot as well. My limbs felt like they weighed too much to lift. I lay down and couldn't wake from sleep for more than a few minutes. Chills. Sweats. I finally crawled into bed, but desperately wanted some kind of distraction. I thought that maybe if I blogged about the experience that might be cathartic too. In the middle of writing this, I got a Facetime call from Lisa Heron in Saskatchewan. She told me all about an exciting event she is planning and we talked until our batteries died. ;-) It did the trick though and pulled me out of this scary funk. Now I feel kind of hyper and full of positive energy and ideas. I'm hoping tomorrow I will feel well again so I can start on all these cool ideas and on Emmett's garden.